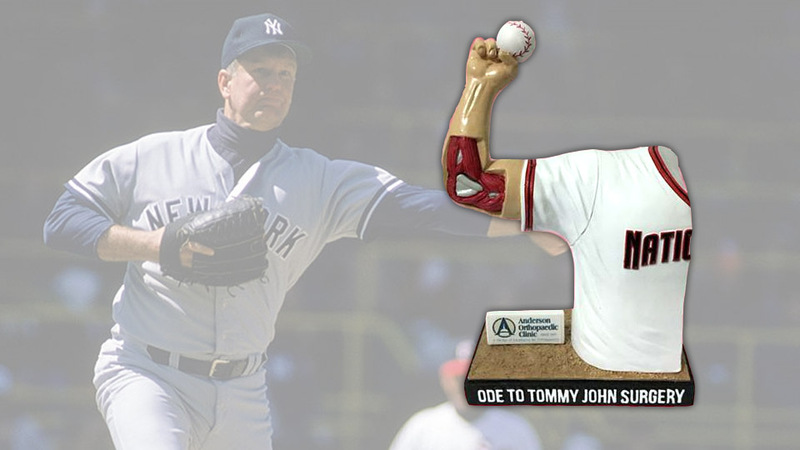 On Saturday, the Potomac Nationals are giving away "Ode to Tommy John Surgery" statues featuring a removable UCL. The Potomac Nationals are giving away a truly unprecedented item on Saturday, and they're not keeping it on the DL. The item in question is an "Ode to Tommy John Surgery Statue," which pays tribute to what the team calls "baseball's most infamous" surgery. This procedure, in which the elbow's ulnar collateral ligament (UCL) is replaced with a tendon from somewhere else in the afflicted player's body, was first performed by Dr. Frank Jobe on pitcher Tommy John. John went on to pitch in 14 Major League seasons after undergoing the surgery. Bryan Holland, the Potomac Nationals' general manager, credited team broadcaster Mike Weisman with the idea of paying homage to Tommy John surgery. From there, the basic premise was honed by what he called the front office's collective "team-oriented promo mind." A key part of this process was determining that the statue would feature an elbow with a removable UCL. "No [Minor League teams] have ever done a promo specific to this surgery," said Holland. "We'll have some odes to Frank Jobe, to [pioneering sports surgeon] Dr. James Andrews, to Tommy John. We're not going to write on the side [of the statue] all the players who have undergone surgery. Then you're jinxing guys. We respect that. We're just putting the spotlight on a surgery that changed the game, on the way so many guys had success post-surgery and came back stronger." The first 1,250 fans through the gates on Saturday will receive the Tommy John surgery statue as part of an evening that also features a "How the Grinch Stole Halfway to Christmas" celebration. This tweak on traditional "Christmas in July" celebrations features an appearance by the Grinch himself, who will assist in distributing the Tommy John statues to fans. Holland said this idiosyncratic combination of Christmas-themed fun and surgery salutes wasn't intentional, just a prime example of what he called "Minor League promo stacking." "We're appreciative of the excitement that's been building around this night," said Holland. "It's a really odd marriage, but this is a classic case of trying to appeal to the whole family." Coming Soon! 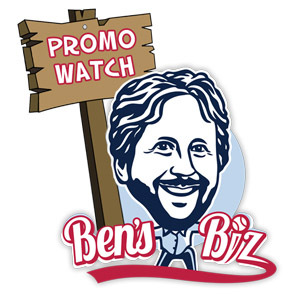 We have reached peak Minor League promo season. There are innumerable giveaways, theme nights and celebrity appearances on the immediate horizon. Forthwith, please find some of the very best. July 5: It'll be a Hormel of a good time in Inland Empire as the 66ers celebrate SPAM's 80th birthday. Happy birthday, SPAM. July 6: The Portland Sea Dogs become the latest team to stage a 25th anniversary celebration of A League of Their Own. For more on how Minor League teams have celebrated this baseball film classic, check out this article by Portland native Josh Jackson. The Human Cannonball graces the Williamsport Crosscutters with his presence. Care to see what the Human Cannonball looks like in action? Then shift your eyeballs slightly downward. July 7: The Binghamton Rumble Ponies pay homage to Binghamton native Rod Serling via their "A Night in The Twilight Zone" theme night celebration. Earlier this season, the Charleston RiverDogs staged the largest Silly String fight in the history of Silly String fights. On this evening, the Inland Empire 66ers will attempt to break the record. It'll be a mess. The Montgomery Biscuits enter the upside down on "Stranger Things Night," a tribute to the massively popular Netflix series. There'll be a sinking feeling in New Orleans as the Baby Cakes pay tribute to Titanic. The Rochester Red Wings kick off a jam-packed weekend with a celebration of Red Wing player-turned-Bull Durham director Ron Shelton. There will be Ron Shelton bobbleheads. July 8: The Spokane Indians kick off their "Redband Rally" initiative, which references the Redband trout that are native to the Spokane River. The team describes the Redband Rally as "a promotional campaign that is designed to connect citizens to the Spokane River, educate about work to clean up the river and support local organizations devoted to river protection." The campaign includes new "Redband" team uniforms (the jerseys feature the Salish language script of the local Spokane Indian tribe -- as well as the introduction of a new Redband Trout mascot). For the second year in a row, the Scranton/Wilkes-Barre RailRiders are staging "Man vs. Marathon." Can a marathon be completed before the conclusion of that evening's ballgame? The Akron RubberDucks, a real-life Cleveland Indians affiliate, are giving away a bobble-stache of a fictional Cleveland Indians manager. That manager is Lou Brown, who skippered the team in the movie Major League. Tacos aren't the only game in town in Fresno. On this evening, the Fresno Grizzlies are staging their second annual "Tri-Tip Throwdown." The Rochester Red Wings continue their jam-packed promo weekend with "Slap Shot Night." This salute to the classic hockey-themed comedy flick features theme jerseys and an appearance by the Hanson brothers themselves. July 9: Photographic evidence is currently hard to come by, but let it be known that two Baltimore affiliates are giving away superhero-themed Manny Machado bobbleheads. The Class A Advanced Frederick Keys are distributing "Spider Manny" bobbleheads, while the Double-A Bowie Baysox are bestowing a "Bat Manny" iteration. The Scranton/Wilkes-Barre RailRiders' "Aaron Judge Growth Chart" giveaway will give kids a lot to look up to. The Rochester Red Wings conclude their jam-packed promo weekend with a tongue-in-cheek celebration of Syracuse Chiefs general manager Jason Smorol. As a result of his team losing their Opening Night ballgame to the Red Wings, Smorol will be coerced into a variety of undignified ballpark responsibilities. July 10: Finally, we end with nothing. Nothing as in the Inland Empire 66ers' "Nothing Night," in which admission is free and fans are encouraged to bring their own food.